Ironically, this holiday is often a time for remembering those who have paid the ultimate sacrifice and given their lives defending freedom. So rather than cutting into an animal who has been bred and drugged to grow so large inside factory farms that he is crippled by his own weight--indeed, he can no longer even reproduce naturally--I invite you to make compassion the centerpiece of your holiday this year. When most people in the United States think of animal sacrifice--if they think of it at all--they likely imagine a ritual of antiquity or a ceremony carried out on some far-off island. But animal sacrifice is alive and well right here in the U.S., and it's not only practiced by religious acolytes. As the nation prepares for Thanksgiving, let's consider for a moment the 45 million or so turkeys who will be slaughtered and served as the traditional main course. Moreover, let's view this annual feast through the lens of animal sacrifice. "Historically, meat-eating was almost entirely sacrificial," says Brian Luke, author of Brutal: Manhood and the Exploitation of Animals. "People did not eat meat unless it was ritually sacrificed. Whereas in our time, it's just a product on the shelf with, for a lot of people, no lingering images of sentience or evidence that the creature had to be killed. That's all changed at Thanksgiving. 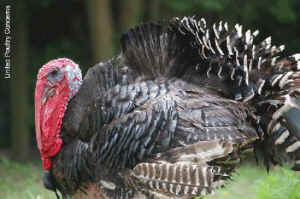 The sentience of the turkey is really brought to the forefront of the imagery around Thanksgiving." Luke posits that this imagery--cartoons, greeting cards that mock turkeys, articles describing the slaughter process, etc.--is meant to emphasize the turkey as a living being. "There's not really a sacrifice in the sense of a full display of power unless there's an understanding that there's a victim," he says. "So what's going on here is a ritualized display of power. To do that, you need to construct the victim, and that happens in a society where we've largely forgotten that animals are sentient before they're made into meat." Standing in sharp relief to this annual focus on the sentience of turkeys is the propaganda system that leads people to repress reminders that when they consume meat they're eating a dead animal. "At the same time," says Luke, "we don't really forget. We bring it out and accentuate it--almost exaggerate it--at certain key points, and those are the points where we want to remember that the animal is sentient, can feel pleasure and pain, has a drive to survive, and must be killed against their will. I think Thanksgiving is one of the key examples of that." Poultry advocate Karen Davis, who offers an illuminating history of turkeys in More Than a Meal: The Turkey in History, Myth, Ritual, and Reality, suggests that the nascent practice of ridiculing this animal through imagery, jokes, and "games" such as turkey bowls (in which participants roll a frozen turkey at a set of bowling pins) serves to demonstrate our superiority over other animals and our power to consecrate such "inferior" beings through the Thanksgiving sacrifice. "The carnivalization of the turkey functions as a magic formula for conquering our fear of being a "turkey,'" she writes. "We poke so as not to be poked at. By devouring another, we master our fear of being devoured. " A pathetic bird, conceived in the mind of Man, is purified and redeemed by being absorbed back into the bowels of Man." Also perpetuating animal sacrifice, in Davis' view, is something much more troubling. "I think one of the main characteristics of many humans is a desire to have somebody suffer and die for them," she says. "Some people like the idea that turkeys and other animals have to suffer and die for us to live." Davis agrees with Luke that Thanksgiving is as much about the turkey as a sacrificial victim as it is about who wants dark meat and who wants white--maybe even more so. It's critical, she believes, that the bird is not transformed into just another meal. "To do so would diminish the bird's dual role in creating the full Thanksgiving experience. In order to affect people properly, a sacrificial animal must not only be eaten by them; the animal's death must be "witnessed by them, and not suffered out of sight as we now arrange matters,'" she writes, quoting that keen observer of social rituals, Margaret Visser. The animal's death must also be shared by the country in order for the turkey's sacrifice to bring an entire society together, says Luke. "I think one of the ways that shows up so strongly is how insistent we are that everybody eats turkey," he says. "It's hard for most people to imagine celebrating Thanksgiving without eating turkey; in fact, some people call it Turkey Day. I think the real drive behind that is that the point of the holiday is to unify the nation, and if you don't participate in the main way we come into unity with each other, it's not working." Advocates of turkey-eating ensure that everyone from prisoners to the homeless partakes in the sacrificial bird. "There's this effort to make sure that no matter what someone's status in society, no matter how poor they are, they get some Thanksgiving turkey, because it's supposed to bring us together as Americans." Ironically, this holiday is often a time for remembering those who have paid the ultimate sacrifice and given their lives defending freedom. So rather than cutting into an animal who has been bred and drugged to grow so large inside factory farms that he is crippled by his own weight--indeed, he can no longer even reproduce naturally--I invite you to make compassion the centerpiece of your holiday this year. From Tofurky Feasts and Field Roast products to a bounty of wonderful plant-based recipes found in an ever-growing selection of vegan cookbooks, there's no need to sacrifice a delicious meal this Thanksgiving. After all, holidays are really about rejoicing with family and friends--not causing harm to others.